If you're the proud owner of a new GoPro Hero 4 Black, or any of the other GoPro Hero action cameras, you have the power to create amazing time-lapse videos. However, getting great results can be tricky, which is why we've penned this guide to show you how. Don't forget to check out our amazing time-lapse video here, or scroll to the bottom to see it. GoPro's new HERO 4 Black Edition boasts the action cam range's best slow-mo capability yet; 120 frames per second at 1080p full HD resolution, offering users the ability to depict a very short event – a water drop, skateboard flip or this guy punching a watermelon – over a long period of time. But one of the versatile little camera's less-explored features is its ability to do the very opposite of slow-mo; take hours of footage and condense it down into a time-lapse video mere seconds in duration. In this guide, we'll show you how to use this feature to shoot and edit dramatic time-lapse videos using your GoPro camera and the bundled editor, GoPro Studio. The best time-lapse subjects tend to be those that depict a stationary view undergoing change; a cityscape at sunrise/sunset, a port with boats pulling in and out, a construction site with multiple tower cranes moving regularly - that sort of thing. 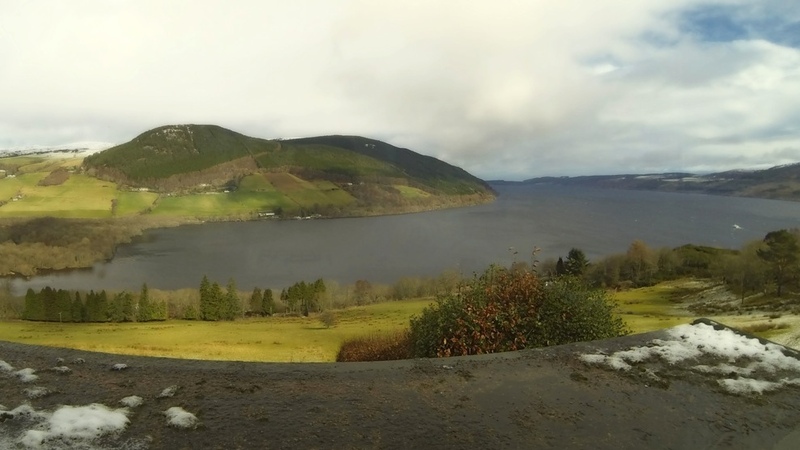 For this guide, we've chosen a spot high above the banks of Scotland's Loch Ness; a land known for its highly changeable weather and seldom-seen prehistoric animals, and therefore perfect time-lapse fodder. For time-lapsing, your GoPro's role is very different to when it's strapped to your ski goggles or clinging by its suction cup to the front of a racing car. An effective time-lapse requires the camera to be firmly mounted perfectly still for a long duration. The beauty of the GoPro is in its size and weight; unlike a bulky SLR and heavyweight tripod, it can be placed anywhere using the myriad of mounts GoPro offers. Here, and with the benefit of a warm house, we've gone for simplicity; the bare camera perched on a dresser up against a window. If you're out and about, though, a mini tripod will give you a sturdy platform from which to shoot. If you have the GoPro smartphone app, its remote control capabilities are useful in framing your shot - though the required WiFi is a battery-hog, so disable it again before you start shooting. Your first step is to check your camera's still image settings. Head to the settings menu (spanner icon) and look for the grid icon - this controls the still image capture size, and on both Hero 3 and 4 models you'll want to select 12MP WIDE, the maximum the camera's sensor allows. Staying in settings, find and select the camera-and-clock icon; here you can choose the time the camera will wait between shots, from half a second to a minute. The shorter the duration, the longer and more fluid your time-lapse will be, but you'll capture less real-time action before your battery or memory card gives up. Finally, exit settings and select the camera-and-clock icon, signifying time-lapse. For the Hero 3 and 3+ models, this is the fourth option you'll come across as you cycle through your camera's modes using the front button. Hero 4 users will find the time-lapse as a sub-option under the third main menu selection, Multi-Shot - alongside a new 'night-lapse' mode that offers flexibility over exposure duration. By far the easiest step; press the shutter button once, check that the LED on the rear of the device is flashing once per photo, then go do something else. It's going to be a long wait. When the battery, memory card or your patience has expired, connect the camera to your computer and check that you have a folder full of JPEGs on your GoPro's memory card. In this example, we've ended up with 475 images of Loch Ness, none of which depict a plesiosaur-like creature sadly. Now, open GoPro Studio. You'll first see a column to the left, with a blue 'Import New Files' button above it. Click it, and select your GoPro device. You don't need to lead Studio to the images directly - it'll search the card for relevant shots. All being well, you'll be told it's 'Building Reference Movie'. You're all set to convert your photos into one time-lapse video; hit 'add clip to conversion list', then 'convert'. Click 'proceed to step two', and you'll be presented with a fairly standard video editor. Drag your video onto the timeline and you'll see a 16:9 letterbox cropped version of your video appear. Now expand the 'framing' drop down in the right hand column. It's worth experimenting with these sliders to check out what they do; you can always click 'reset all' if you make a mess of things. Notice how far to the left the 'zoom' slider is situated. There's a good (and vaguely exciting) reason for that; because we've made a video out of full-resolution, 4:3 format still images, we're actually working with slightly-higher-than-4K resolution video here. In order to fit it all in to our 1080p HD video, GoPro Studio has to zoom out. In short, there's a lot of extra image resolution here for us to play with. While keyframes might be pushing the boundaries of a basic how-to, it'd be a shame to waste some of that extra image resolution. Keyframes allow a setting to be slowly changed over time as a video progresses; in this case, we'll introduce a zoom to add a sense of movement to the clip. Making sure the yellow edit line is at the beginning of the video, press the [+] button under the framing sliders; this will insert a keyframe at that point in our video. Now, move the yellow edit line to the very end of the clip, and click that [+] button again. Now grab the zoom slider, and move it to the right as far as you like. We've gone about 75% of the way here. To check that the keyframing has worked, grab the yellow line and drag it - you'll see the video now zooms as it progresses. 'Image', above the 'framing' drop down, offers subtle tweaks to contrast and colour. We've nudged the saturation up a tiny bit to bring out the blues and greens of the landscape. The 'video' tab enables you to add a fade (measured in seconds) in or out of your video. Finally, if you have some licensed music or a title to add to your video, you can drag these in below your video track. Click 'export' in the top right and, under 'preset', select 1080p HD. GoPro Studio can export up to 4K, but as we've zoomed in to our content we'll want to stick to a lower resolution to ensure things don't look blocky in the end result. Choose a location to save your video, and hit export. You're done!